Using a variety of filters, most of my unwanted email goes to a spam folder. Sadly, the occasional important email ends up there too, so I sometimes do a really quick scan of the spam folder before I delete it. Other days I figure that important emails will come again or the person will call me. 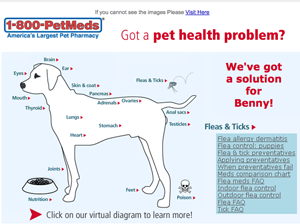 But I rescued this email from Pet Mets because the subject line asked “Does Benny have a health problem?” Because instead of being about them, who I could care less about, it was about Benny, whom I adore. Benny is my dog, Benny Bix Ochman Labradoodle Puppy, and there aren’t too many things in the world that interest me more than his health and well-being. So I opened the email and then spent 20 minutes on their site reading their library of dog health articles. I didn’t buy anything because I didn’t need anything, but next time Benny needs vitamins or whatever, I will surely go to this site. Personalization is possible, personalization is necessary. Believe me, I never would have rescued a “Dear Pet Owner” from the trash.